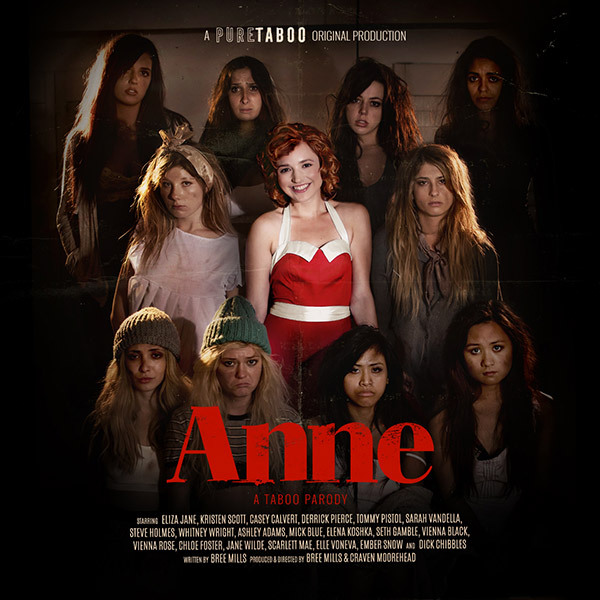 Thread: Anne- A Taboo Parody! What is this TGP I hear of? The first scene from PureTaboo.com's latest feature 'Anne- A Taboo Parody' is live on the site this week! The feature series features an all-star cast including Ashley Adams, Casey Calvert, Kristen Scott, Whitney Wright, Tommy Pistol, Derrick Pierce, Sarah Vandella, Mick Blue, Seth Gamble, Steve Holmes and Eliza Jane. Anne presents a twist, using Pure Taboo's acclaimed blend of psychologically intense characters, breathtaking cinematography, and some of the best acting in the industry. Now that Anne (Eliza Jane) is eighteen, she hopes to be reunited with the parents who left her behind. But her dreams are mixed with the psychological damages of being a wayward girl in a transition home used for all kinds of under-the-table labor. An environment void of order and reality sees her adopted into the possession of a rich businessman, Mr. Westfield (Derrick Pierce), who's attraction for Anne clouds his judgement, making a scheme to retake Anne, concocted by the lecherous owner of the transition home Mr. Hands (Tommy Pistol) possible. Will Anne survive scandal and manipulation to find where she truly belongs? This perverted tale is sure to draw your traffic in and leave them longing for the upcoming scenes! Let us know if you need anything to help you promote today!